Figure 1: Bell-shaped curve. The central tendency, the middle is the median, 50th percentile. 25% to the left is the 25th percentile, the first quartile (Q1). 25% to the right of the median is the 75th percentile, the third quartile (Q3). 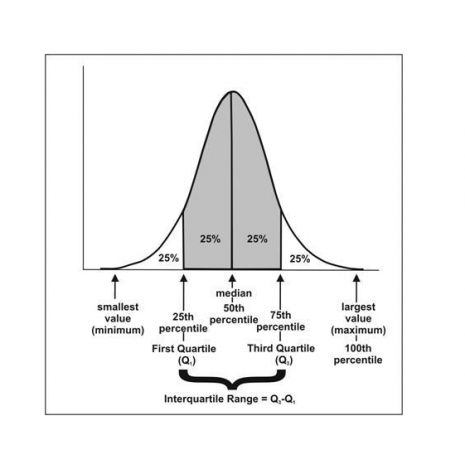 The interquartile range goes from Q1 to Q3 and makes up 50% of the area under the curve. The largest value is the 100th percentile. Figure 2: Left panel: Visible (VIS) and NIR images of Arabidopsis plants at the rosette stage. Right panel: Distribution of NIR pixel intensities for two “digital plants”, one under treatment 1 (well-watered) and one under treatment 2 (drought). The green and red vertical lines intersect the corresponding I75 (or Q3) values for each distribution. Each line in the table corresponds to I75 (or Q3) values calculated from the NIR pixel distribution for each sample (1 to 30) at different times after sowing (DAS); n=7 (biological replicates). § The I75 value has been selected for analysis because it detects early changes in NIR intensity signals (Vello et al. ; 2015). i) The 75th percentile (I75) of the distribution of NIR pixel intensities is calculated for each “digital plant” (i.e. segmented plant in NIR image). *Select an I75 NIR intensity value for each sample that is consistently repeated during the first days of measurement (before a treatment is applied or before changes in NIR intensity are observed). *Choose 80 (Day2) as the I75B value. The value of 80 is the lowest consistent value during the first days of measurements. v) Depending on the researcher and experiment, a cutoff value can be set to classify plants as stressed/not-stressed, healthy/non-healthy, etc*. * See also “Important notes” at the end of the document. Figure 3: I75 (Q3) NIR intensity index. Means and standard errors of the indexes based on the 75th percentile (i.e. third quartile; Q3) of the NIR intensity for each line and measurement. Water-limited (A,C) and well-watered (B,D) conditions for “experimental protocol 1” (A,B) and“experimental protocol 2”(C,D; DR: drought; WW:well-watered). WT: wild type (control), gtl1-5 and drs1 correspond to different Arabidopsis lines (see reference paper for specific details). If NIR light reflected from plant tissue is to be correlated with water content, the researcher needs to first generate a calibration curve using an independent method for water content estimation (e.g., shoot dry versus fresh weight). The calibration curve needs to be generated using the subject crop and defined experimental conditions (identical to those planned to be applied in the high-throughput digital phenotyping experiment). The calibration curve can then be used for calibration of NIR data coming from the high-throughput digital phenotyping experiment. An appropriate statistical method to evaluate the results needs to be selected and applied by the researcher. This method can vary and depends on the hypothesis, experimental setup, size of the experiment (e.g., number of replicates, number of treatments, number of plant lines), etc.